On day two we woke well-rested and pumped to finally make our way towards the Burgundian wine country we'd been dreaming about since we planned the trip. 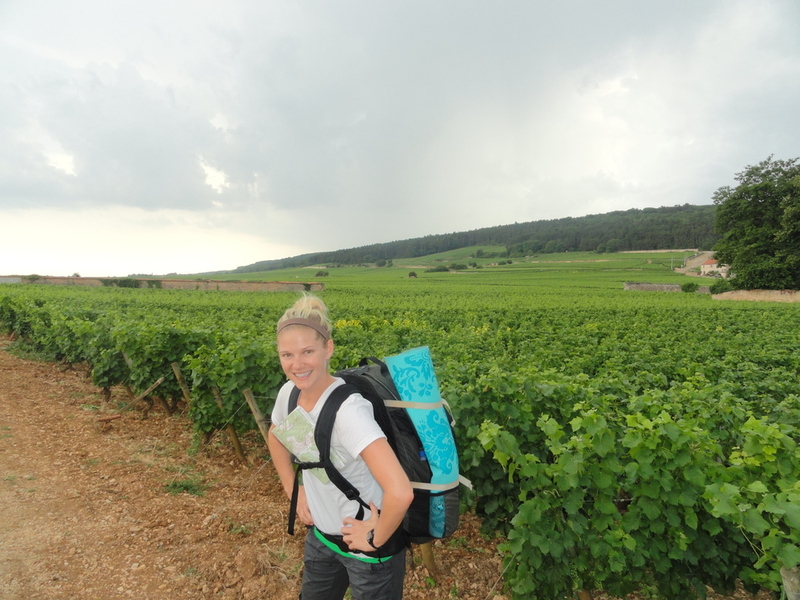 Following Pierre's advice, we set off down that teeny line connecting the trail we were previously on with the Route des Grands Crus, and low and behold, within 30 minutes we hit a sea of vineyards and our first tiny French town, Fixin. I about peed with excitement when despite being under construction, the owner of the only Café in town threw open her door and offered us a fresh Café au Lait and breakfast biscuits. Over coffee, we checked the map, having apparently done a terrible job of that before setting out the day before, and confirmed that our new route, which was forest -free and flat, really did snake charmingly through the villages of Gevrey Chambertain, Morey Saint Denis, Romanee Contee, Nuit Saint Georges, all the way into Beaune. We made it to Gevrey just before lunch time. It was oppressively hot and we were wiped from lugging our huge packs for the last few hours, so we popped in the local tourism office for info on the town and to hopefully book Gite (B&B) for the night. *Note: I give a BIG shout out the tourism office in Gevrey Chambertain. Not only did they watch our backpacks while we explored town, which any backpacker knows is a HUGE solid, but, when no rooms were available in their town, the woman called ahead to Morey Saint Denis (about 3 km away), and booked us one there. We were indescribably grateful for the hospitality...and the lightness of not carrying our backpacks all around town. This afternoon was the most magical of our four-day hike and among the top five of our whole Honeymoon. We scrounged up a baguette, cheese, salami, wine, and chocolate just in time to beat the epic "French lunch-time shutdown" and made our way to the center park. Clouds hung low in the sky and we plopped down in the grass, kicked off our shoes and demolished lunch...and whole bottle of Burgundy. As if it couldn't get any better, in the midst of making love to our lunch, it began to pour down rain. We laughed so hard with absolute joy that I spit out my salami. I mean really? The situation seemed unreal: here we were in the middle of Gevrey Chambertain, giddy from the wine, full of meat, cheese and chocolate, caught in a warm, romantic rainstorm. Life does not get much better. When the rain let up, we kept the wine party going and popped into three more tasting salons, only one of which I can remember the name of: Philipe Leclerc. All three places were amazing, and the city center is easily walkable, so we just strolled from one to the next. Feeling warm and happy from the wine, we made our way back to the tourism office, donned our packs and hiking boots, and huffed it to our gite in Morey Saint Denis. The air had that heavy, fresh, warm scent that follows a summer storm, the road was flat, and if we saw a vehicle, it was a tractor or tiny Renault packed with vineyard workers heading home for the day. We took our time, flanked on all sides by rolling vineyards, and arrived in MSD just before sundown. The gite was perfect: quiet, comfy, with gorgeous vineyard views and it even included a resident cat and breakfast. There was only one store open in Morey and It had a bit of everything. It was the boulangerie; so we got a baguette, the wine shop; so we got a bottle, and the grocery; so we got sliced ham, pasta and canned green beans for dinner. Relaxed, buzzed, full, and in love with the world and each other, we fell into the deepest sleep...the kind that only that perfect combination of happiness and contentment can bring.